Dallas was running out of ideas to pass our time on Saturday and so he suggested we go to Rumtek to see the monastery over there. It is touted as one of the main tourist attractions around Gantok and so I approved of the plan. Rumtek is around 22 kms from Gantok with good access via taxis , or so I thought. We went to the taxi stand but had to wait for around 30 minutes for the taxi to get full before it started . It was a one hour drive through lush greenery and some entertaining local gossip. Along the way one gets good vistas of Gantok city surrounded by green mountain slopes giving an impression of a rudimentary castle in the air. The first thing I notice as I enter the monastery complex is the ITBP guard station, from which one of them gives me a peering glance to inquire if I am a foreigner or not. I speak to him in fluent hindi to eliminate any of his doubt. A five minute walk through the complex gets us to the main gate of the monastery where I buy two entrance tickets for us. I walk into a huge quadrangle with the monks quarters on both the flanks and the main temple opposite the gate. 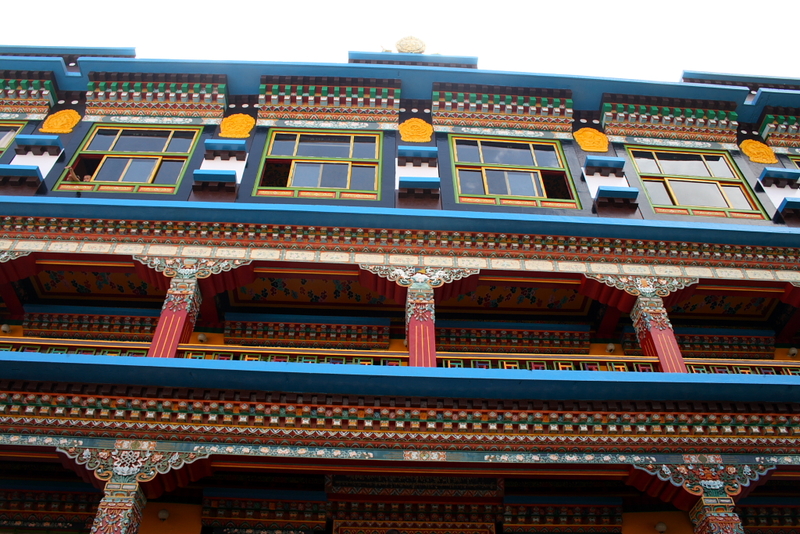 It is the largest monastery in Sikkim and home to the Karma Kagyu sect of Buddhism. 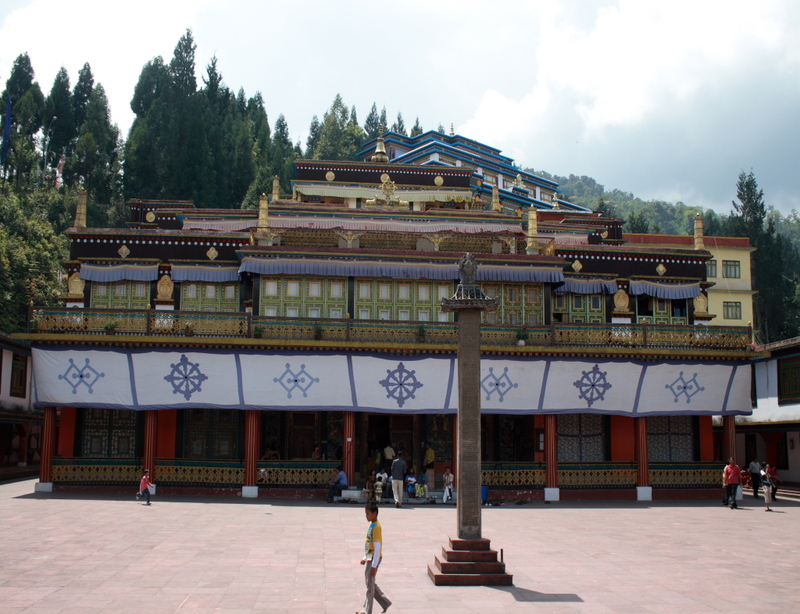 The Rumtek complex was founded by the sixteenth Karmapa, Rangjung Rigpe Dorje after he ran away from Tibet to avoid communist prosecution and to continue with his preaching. The main temple is a magnificent and opulent four storied structure. I went inside the main temple hall which is open to all visitors and was enthralled by the vividity of the paintings and it’ colors. Unluckily I did not have much understand into the meaning of the paintings and Dallas seemed to be least interested in them. 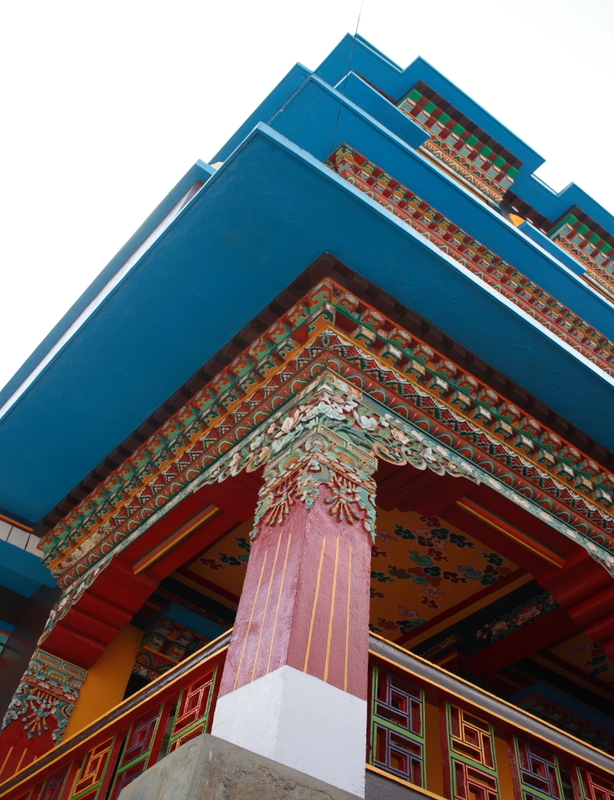 The hall is supported by red pillars from which silk banners and intricate thangkas hang. From here we walked towards to Nalanda Institute and the Golden Stupa. I was really astonished to see the number of ITBP cadets and they had an entire army post inside, it was both sad and painful to see a heavy army presence in such holy a place. The Nalanda Institute was a richly painted five storied building. The institute was founded to preserve and propagate the teachings of Buddha and, in particular, the Kagyu tradition of Mahayana Buddhism. It is supposed to be the most important learning centre for Buddhism in the world. Since we could not go in, just had to admire the institute from outside. By this time Dallas was really getting restless and so could take only a brief glance inside the Golden Stupa. It contains the precious relics of the sixteenth Karmapa and is bejeweled with ancient turquoise and coral, and decorated with filigree and fine metalwork. came out and roamed about a bit in the gardens to take in the peaceful and serene atmosphere, till I was interrupted by an impatient Dallas and asked if we could leave. So started our homeward journey which turned a bit ugly and adventurous. On reaching back to the road we did not find any shared jeep to take us back and after 30 minutes of waiting did not yield any results we started walking down. But as fortune favours the brave we did manage to get one after about 20 minutes to comfortably reach Gantok.